Black flies, horse flies, deer flies, moose flies, then a fifteen minute “bug window” – usually just before dusk, during the changing of the guard – followed by mosquitoes and no-see-ums. I’ve spent my summers in northern Quebec canoeing and portaging, splitting firewood and scouting rapids, and the bugs have become part of the experience. Through it all, I’ve learned to love this landscape, though it helps that I wear a hooded bug shirt. But what to do about insects while writing up research notes? Planning interviews? Coordinating on the phone with important sources? With research in mind, the first thing I bought with my summer grant was a bug-proof screen house that can turn any northern Quebec campsite into a workable office. I can cook, eat, write, think, maybe sleep, and even conduct my interviews in my new gazebo. I expect this is going to be a good summer – certainly, it will be different. While my classmates all took off for tropical countries in the global south, I head north to the boreal forest of Quebec – to Eeyou Istchee, land of the James Bay Cree, an indigenous First Nation. Yet despite driving almost 800 miles north of New Haven, I’ll still be encountering many of the same issues that other Yale students are researching the world over: rapid natural resource extraction to feed consumption elsewhere; indigenous peoples struggling for land and life; confusing and conflicting perspectives on conservation, management, wilderness, indigeneity, and stewardship; the diminishment of place-based knowledge; and an exciting new movement redefining sustainability from the ground up. 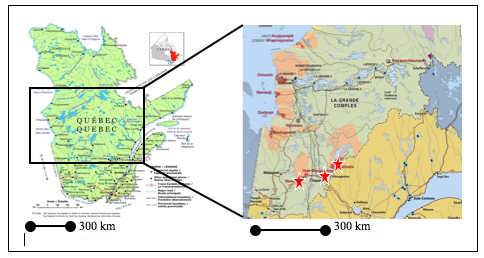 In this map of James Bay, stars represent the three communities where Naomi Heindel will be conducting research this summer: Waswanipi, Ouje Bougoumou, and Mistissini. Driving to my research site, rather than flying there, drives home the pervasiveness of these issues. Here in New England, the flip of a light switch or the purchase of a two-by-four connects us to the Cree and their land. My time in James Bay in the past – from the canoe, the sawmill, the forestry office, the traditional tent – has made me uncomfortable with that connection, and left me eager to find ways to understand and communicate the social and cultural dimensions of natural resource use and conservation. This summer, I’ll be focusing on the effects of logging on traditional Cree land use and stewardship. The Cree are intimately connected with their land, deriving their culture and identity from it, and their system of forestry and wildlife management goes back hundreds, if not thousands, of years. The Cree’s continued stewardship of their land is a gauge of their self-determination and autonomy. 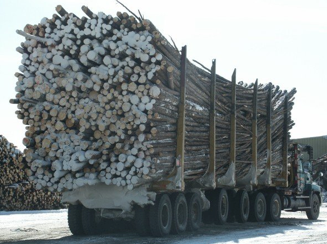 A truckload of James Bay black spruce heads to the saw mill. My research will investigate how non-Cree forestry practices affect Cree culture. I’m interested, more specifically, in how techniques like mosaic patch cutting alter cultural and ecological sustainability; how logging roads fragment the social and physical landscape; and what ostensible Cree participation in forestry management meetings really looks like. I’ll be meeting with Cree forestry administrators, Cree hunters, Quebec government workers, boreal forest ecologists, and logging company representatives. 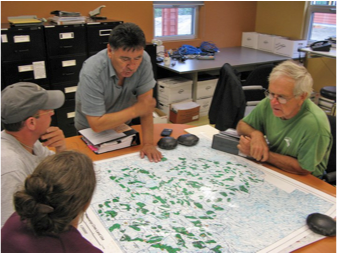 I’ll sit in on planning and mapping meetings and visit traditional hunting territories. If my past experiences in James Bay are anything to go by, I’ll eat a lot of bush meat, listen to a lot of stories, spend a fair amount of time in a canoe, and end up having to rewrite everything I thought I knew about the Cree, about forest management, and about research itself. I’ve been calling my research “A Changing Balance: Logging, Stewardship, and Participation in James Bay, Quebec” after a sign I found several years ago in Mistissini that read “Restoring the Balance.” How will the balance – between village life and bush life, between modern and traditional Cree identity, between economy, ecology, and culture – have changed in the past few years? What trajectory are the Cree and their lands on? I look forward to learning and passing stories on through Sage Magazine this summer – that is, if the bugs don’t get me first. Naomi swaps stories with a Waswanipi forestry administrator in 2010. Naomi is a second year Master of Environmental Science student at the Yale School of Forestry. A Vermont native, she has explored the forests, rivers, lakes, and Cree communities of northern Quebec by canoe and satellite imagery, as well as through the lens of social ecology.